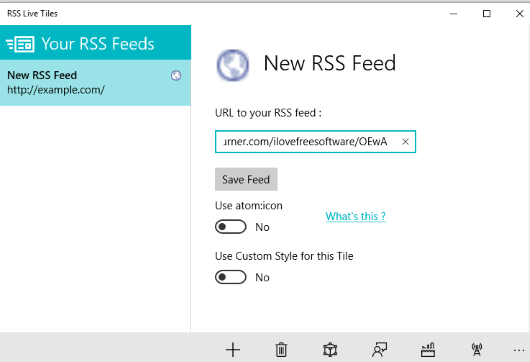 This tutorial covers how to see RSS feed in live tile of Windows 10 Start menu. Once the live tile is added for a particular RSS feed, you will be able to remain updated about the latest activities for that particular website or channel. Whether you want to check updates for a blog, video site, or something else, you can see that in live tile right from Windows 10 Start menu. To see RSS feed in live tile of Windows 10 Start menu, I have covered a free Microsoft Store app, which is known as “RSS Live Tiles“. You can add multiple RSS feeds and then pin any of those RSS feeds to Start menu. As RSS feed is added as live tile, you can resize it to wide, medium, large, or small. Removing a RSS feed live tile is also easy as it is a native feature of Windows 10. In the screenshot above, you can see that I added RSS feed of our website in live tile of my Windows 10 Start menu. This app helped me for that. 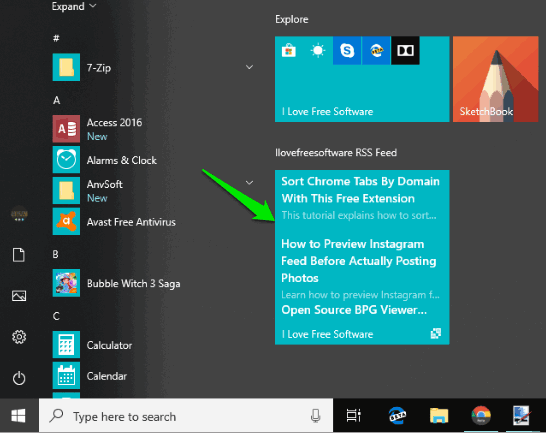 How to See RSS Feed in Live Tile of Windows 10 Start Menu? Step 1: The link to open homepage of this app is added at the end of this tutorial. Use it and install the app. Step 2: Open its interface and click the “+” button. Step 3: It will add an example RSS feed but give you option to edit it. In the available box, add the RSS feed URL of your favorite site and press Save Feed button. The option to set custom style for tile is also there which needs some formatting. You can play with that option or leave it if you don’t understand it or have no interest. 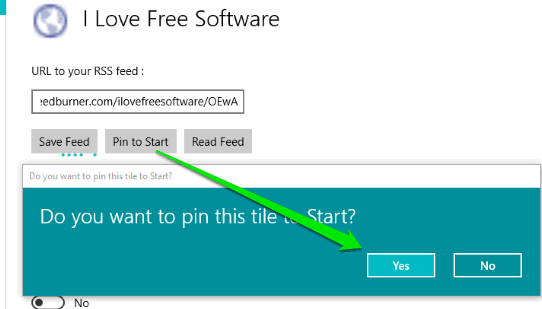 Step 4: Once the feed is saved, you will see a “Pin to Start” button. Use that button and it will prompt you to add it as live tile to Start menu. Press Yes and done. Before adding RSS feed to Start menu, you can also use “Read Feed” button and a separate interface of this app is opened where you can see the latest updates related to that feed. Step 5: Open Start menu and there you will see “RSS feed live tile” pinned by you. You can also right-click on that tile to resize it, unpin it, etc. In a similar way, you can add RSS feed in live tile of Windows 10 Start menu for any other channel/website. You can click on that tile and RSS Feed Reader of this app will open to help you see all the updates. We’ve also covered some best free RSS readers for Windows 10. This Microsoft Store app to see RSS feed in live tile in Start menu of Windows 10 is pretty interesting and useful, no doubt. You can pin live tile of RSS feed of any of your favorite sites and check the updates directly from Start menu. Resizing and removing a live tile is also easier. So you will have full control on the live tile.